MR’S 75TH ANNIVERSARY said this about climate change, “You can suffer, you can adapt, or you can man- age.” The same can be said for social media. We’ve demonstrated that there is real value – and considerable risk – to crowd sourcing. It’s a new area of col- laboration; a new area of social interac- tion where we don’t have a lot of history, and we’re really not sure where we are going. It doesn’t mean we shouldn’t use it because we’re scared of it. The fact is, it’s there, and there’s no fear of en- try when an event occurs and anybody standing around with a cell phone with a camera in it can actually become part of the event or the outcome of that event. I think we have to deal with the fact that this is the reality we live in. Are there missions the Coast Guard could cede to others in an effort to more effi ciently spend money or more competently get the job done? If we have a statutory obliga- tion to do something, and we elect not to do it because of a risk-based decision or lack of resources, that’s one thing. But if it’s been decided for policy reasons that we shouldn’t be in line of work anymore, it might not be within our authority to make that decision. This is a tricky ques- tion because if you remember during my tenure as commandant, the Coast Guard resided inside another committee, not inside the homeland security committee. Guard. And he took concrete steps to make sure we were carrying out our re- sponsibilities. Guard, because there are some out there. 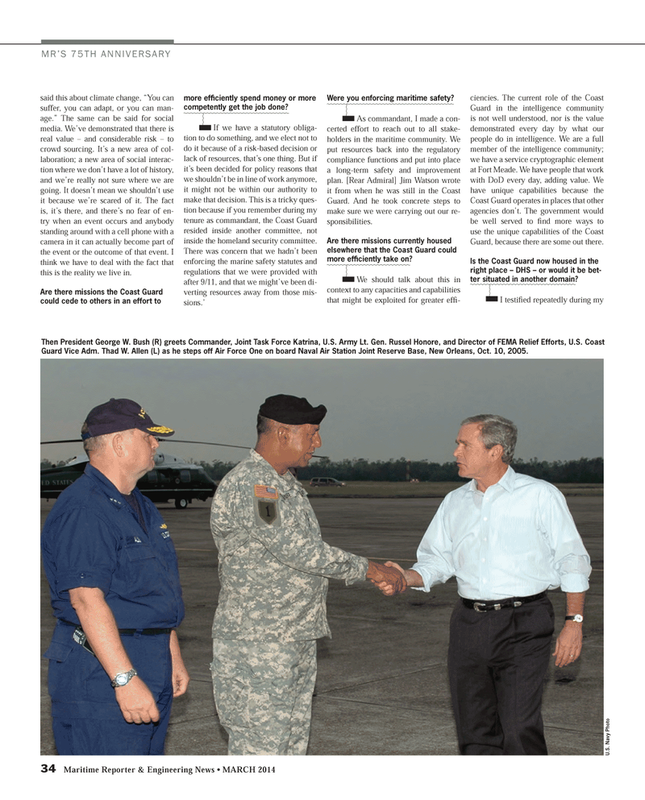 Guard Vice Adm. Thad W. Allen (L) as he steps off Air Force One on board Naval Air Station Joint Reserve Base, New Orleans, Oct. 10, 2005.